Head south on Water Street toward Beach Road. Take the 3rd right onto Beach Road. Continue onto State Road. Turn right onto Middle Road. Take the 2nd left into The Yard. Total Travel Time: 25-­‐30mins. Head southwest on Water Street toward Davis Lane. Take your 2nd right onto Cooke Street. Turn left onto Edgartown West Tisbury Road. Turn left on State Road. Continue onto South Road. Make a left onto Middle Road. Take your second left into The Yard. There is a great public bus service on Martha’s Vineyard that connects to all of the towns on the island. There is a bus stop just a short walk from The Yard in front of the Community Center, which runs every hour. Fare $1 per town, each way. Located 6 miles off the coast of Cape Cod Massachusetts Martha's Vineyard is accessible only by plane or boat. There are no bridges or tunnels connecting Martha's Vineyard to the mainland. The most common method of transportation to the island is by ferry. For those bringing a car to the Island, the only option is the Steamship Authority ferry departing Wood's Hole, MA. Passenger-­‐only ferries (most of which operate seasonally, May-­‐Oct.) also leave from New York, NY; Quonset Point, RI; New Bedford, Falmouth and Hyannis, MA. Take Route I-­‐95 to Providence, RI, in Providence exit onto I-­‐195 East to Wareham, MA. i-­‐195 ends at I-­‐495/route 25, take exit for Cape Cod and the Islands, Route 495/25 East, follow across the Bourne Bridge and then follow Route 28 to Falmouth and Woods Hole. Distance from New York City -­‐ approximately 260 miles. Then it's time for a ferry! Traveling south on route 128 (interstate 95) or 93 south from downtown Boston, take MA-­‐24 S toward BROCKTON / FALL RIVER. On MA-­‐24 take exit 14A merge onto I-­‐495 S via toward CAPE COD. Continue along I-­‐495 S which will become MA-­‐25 E until you reach the Bourne Bridge. Once across the bridge you will enter a roundabout (rotary), take the second exit onto MA-­‐28 (GEN MACARTHUR BLVD). Continue along MA-­‐28 and go around the second roundabout, continue on MA-­‐28 toward Falmouth, Wood's Hole and the Islands. As your near Falmouth, MA-­‐28 will turn one lane each way. If you plan on traveling to the Vineyard aboard Steamship Authority without your car, follow the signs posted by the Steamship Authority to an SSA parking lot with space available. DO NOT drive all the way to Wood's Hole; you will just have to drive back to the parking lot to which you were directed earlier. If you are bringing your car across, continue along the two-­‐lane road, route 28, until you reach Woods Hole and follow the signs directing you to the Steamship Authority or Ferries to the Islands. 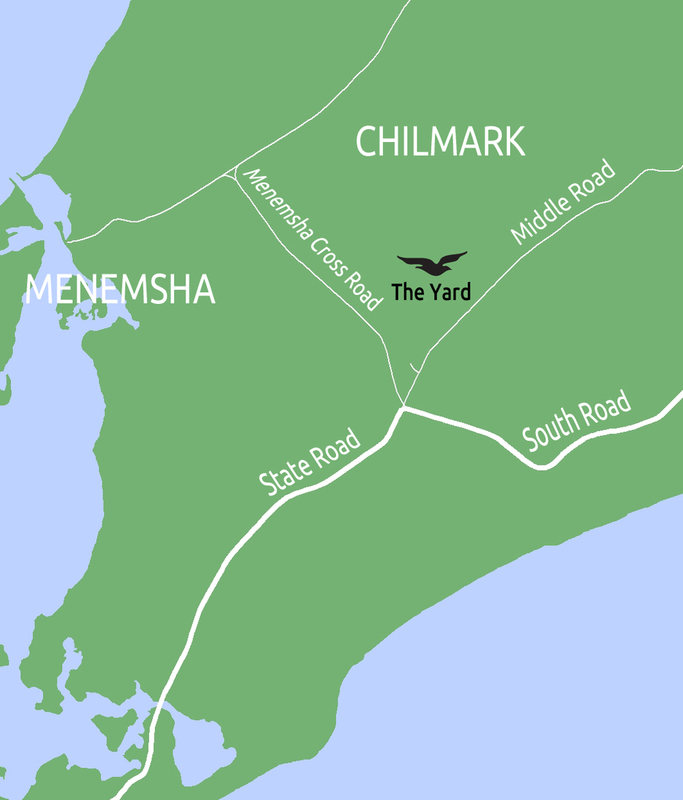 Martha's Vineyard airport is primarily served by Cape Air and a number of charter companies on a year round basis. Cape Air flights that serve the Island depart from: Boston, Providence, Hyannis, New Bedford and Nantucket. For flights to and from New York, Cape Air partners with Jet Blue for service via Boston. JetBlue and Delta also fly to and from the Vineyard non-­‐stop from New York's JFK Airport during the peak summer season. US Airways service to the Vineyard departs La Guardia airport in New York, Ronald Regan National in Washington DC and Logan Airport in Boston. Tradewind Aviation offers scheduled flights from White Plains, NY & Teterboro, NJ. Depart Thursday or Friday evening and return Sunday evening or first thing Monday morning. An added attraction is their pet friendly policy.